Have you noticed that negative comments and events stick with us much longer, and influence us more than positive ones? Your teacher praises you for an assignment or task, and you bask in the glow of appreciation – for a little while; the effects wear off quickly. A negative comment sticks with you much, much longer; you may remember the burn for years. Why can’t we hold on to the good stuff? 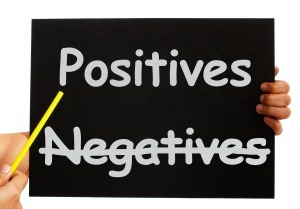 Our brains turn out to have a bias to negativity. It’s measurable, and there have been multiple brain scan studies done that show that our brain reacts more strongly to negative stimuli. The big question then is how do we fight against our brain’s bias to negativity? What can we do to make sure negative remarks and criticism don’t get us down? The first step is that we realize that negative bias exists, and it’s here to stay. You can learn to take each piece of negativity with a grain of salt. It can be incredibly helpful to acknowledge that our mind and heart may be overreacting about something negative. On the flip side, this knowledge also allows us to make it a point to savor the positivity. Don’t dismiss a compliment. Instead, honor it, savor it, think about it, and make it a point to remember it, and allow it to lift you up when negativity brings you down. Of course all of this is easier said than done. Since this bias to negativity is hardwired in our brains, it takes a lot of time and effort to build new, more positive habits. Remind yourself each morning that your mind is trying to force you to focus on the negative stuff and that it takes a conscious effort to balance it out by being mindful off all the good and happy things in our lives. Remember that list you started, back on Day 1? Use that! Over time this will allow us to grow a thicker skin when it comes to unwarranted criticism. Should you ignore every single comment or suggestion that you don’t like? Of course not. There is such a thing as constructive criticism that helps us to grow and get better at what we do. What we need to guard against are the negative words, events, and feelings that make us go hide in a cave. Instead, we want to use the positivity around us to lift us up and help us make it through the tough times, get stronger, and get better at what we do. Reflecting on both the good and the bad on a daily basis can be a great exercise to help us gain a little distance and see everything that’s happening to us in a better light. Keep a journal or set aside some time for quiet contemplation. Talking things out with a friend, particularly when you’re struggling with something negative that you’ve having a hard time getting past is another great idea. Above all, do what you can to outweigh the negativity with the good stuff. Keep a box or file with some of the best positive emails and comments you’ve gotten. Peruse through them whenever you need to counteract something negative. As time goes by you’ll grow that that thicker skin that will protect you from your harshest critics. What do you do to stay out of the Dark Side? Share with the Happiness Habit Facebook group – if you haven’t joined, now is a good time!